MCU Embedded, and based on optoelectronic, semiconductor laser and other advanced technology, measuring RPM is accurate non-contact. 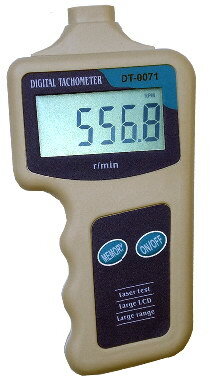 Wide range of the measurement and high-resolution. Automatic measurement and manual measuring selection. The power of laser is of high and low selection to adapt the far and near distance. Automatic to record 50 sets of data, and the sampling interval time could be changed. Automatic to record the Max, Min and Average data. LCD light helping work in the dark. Auto shut off after 30seconds without operation. 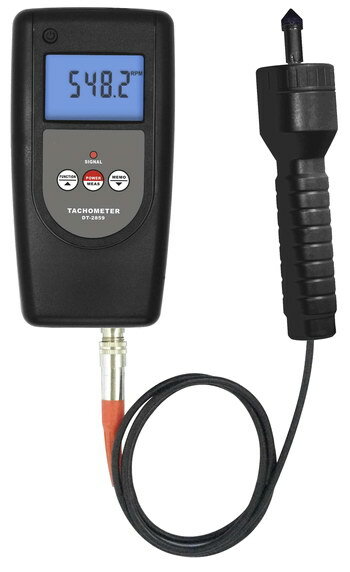 0ºC~50ºC (32ºF to 118ºF) <70% R.H.
-10ºC to 55ºC (14ºF to 122ºF) <70% R.H.
Tachometer is one of the necessary instruments in machinery industry, which is used to measure rotation speed, linear speed or frequency of electric motor, as well as rotation speed of impeller blades, roller and shaft. It is widely used in industries like electric motor, fan, washing machine, textile, automobile, aircraft, ships, etc. 1. Maximum value, minimum value, average value, last measured value holding. 3. A wide range of measurement, high resolution. 4. Low battery indicator, LCD backlight display, automatic shutdown. 5. With combination of latest microprocessor technology and laser technology, the instrument is more intelligent and more reliable. 6. Large LCD screen display, clear reading. components, and light but hard ABS plastic for the shell, which is good-shaped and user-friendly. 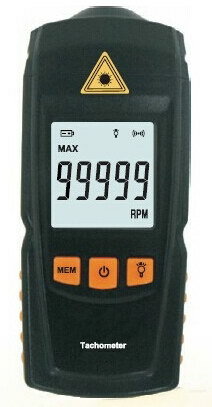 5 digits LCD Display, Max 99999. 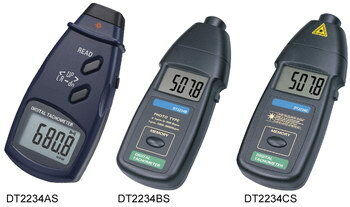 DT-2236 with photo, contact and surface speed functions. DT-2236L with laser, contact and surface speed functions. The biggest difference between model DT-2236 and DT-2236L is the measuring way, DT-2236 is LED photoelectric; DT-2236L is Laser photoelectric. 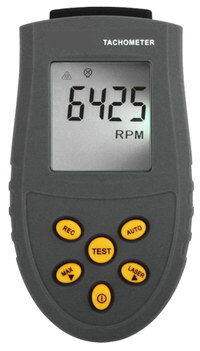 Used to measure rotative velocity, surface speed, frequency of motor. Applicable to the product departments of motor, fan, chemical fiber, washing-machine, automobile, airplane, steamer etc. * Multifunctional, one instrument combines PHOTO TACH. (RPM) & CONTACT TACH. (RPM , m / min, ft / min ). It can also be applied to the measurement of Frequency, Cycle, Pulse Times, Pulse Distance, User-defined Pulse Distance, etc. * Digital display with no guessing errors. * Wide measuring range and high resolution. * The last value / max. value / min. value will be automatically stored in memory. * The use of durable, long-lasting components, including a strong, light weight ABS-plastic housing assures elegant shape and ease of use. * Use USB data output to connect with PC. * Provide Bluetooth data output choice. Used for measuring periodic motion, to check the imbalance and deflecting of moving machinery. 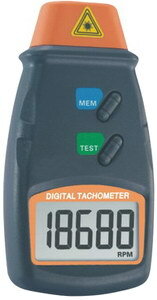 Also can be used as contact tachometer and photo tachometer. * In accordance with ISO 2954, used for periodic measurements, to detect out-of-balance, misalignment and other mechanical faults in rotating machines. * Specially designed for easy on site vibration measurement of all rotating machinery for quality control, commissioning, and predictive maintenance purposes. 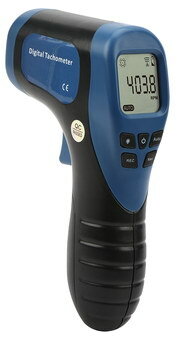 * Multifunctional, one instrument combines Photo Tachometer & Contact Tachometer. 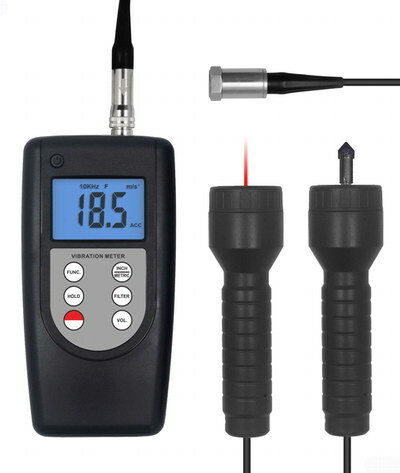 Be able to measure rotation rate RPM(r/min) & Frequency Hz. * Individual high quality accelerometer for accurate and repeatable measurements. * Wide frequency range (10Hz~10kHz) in acceleration mode. * Optional headphones for use as electronic stethoscope. * Bearing condition monitoring function. Annex : portable Paper boxes, reflective paper (9 centimeters x2), tapered adapter, funnel-shaped adapter, wire-speed ferry. Memory: Max. Value, Min. Value, Last Value. * We adopts advanced micro-process technology, photo technology, semiconductor technology etc. to measure line velocity , rotate speed and count. 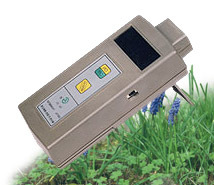 * Wide measuring range, high resolution , strong anti-interference. * Large LCD display , clear readings , no parallax. * Max. value , min. value and the last value can be automatically stored . * External connected AD adapter is favor of continuous test for a long time . * When supply voltage is lower than , it can automatically indicate. * Attachment fittings and photo fittings can be transformed each other at any time. В настоящее время большой популярностью пользуются цифровые лазерные тахометры, являющиеся просто незаменимыми приборами при выполнении операций регулировки электроблоков зажигания автомобильного двигателя, при определении порогового значения срабатывания экономайзера и др. Высокоточный тахометр лазерного типа DT-0071 измеряет скорость вращения в интервале от 30 об/мин до 99999 об/мин на расстоянии до 1,5 м.
Областью применения тахометра DT-0071 является проведение высокоточных измерений скорости вращения предметов, находящихся на удаленном расстоянии, посредством лазера. Прибор имеет цифровой лазерный метод измерения – проводится анализ лазерного сигнала, отраженный от объекта. DT-0071 оснащен большим, удобным для чтения экраном и возможностью проведения тестирования на большом расстоянии. Имеется встроенная память измеряемых показателей. Все измерения проводятся с точностью ± 0,02% при рабочей температуре 0-70 °C. Питание ведется от трех батарей ААА по 1,5В. Габариты тахометра – 72мм х 136мм х 33мм, вес – 146 г.
Сегодня сверхточные тахометры лазерного типа весьма популярны. Такие приборы позволяют проводить своевременные и точные измерения скоростей вращения поверхностей. Тахометры выпускают трех различных видов. Первый тип – бесконтактные приборы. Здесь на вал тахометра прикрепляют специальную ленту, и прибор при вращении такого вала лазером или фотоэлементом производит подсчет числа возникновений метки. Вторым типом являются контактные тахометры, оснащенные специализированным контактным элементом, предназначение которого – отсчитывание скорости вращения. Третьего типа прибор относится к комбинированным и функционально совмещает в себе первый и второй тип. Портативный тахометр DT-006 лазерного типа имеет интервал измерений 20～50000 оборотов в минуту. Измерения тахометр проводит с точностью 2×〖10〗^(-4)×N ± 1цифра. Время, за которое прибор будет адаптирован к условиям окружающей среды (рабочая температура 0ºC-50ºC) за 1сек. Масса прибора – 300г. Расстояние для измерений: 50-400 мм, дисплей ЖК. Габариты – 78×38×180 мм.